The 8th Grade Division of the Clash For The Cup was loaded with National Talent. Here’s Part 2 of our Top Performers from the weekend. 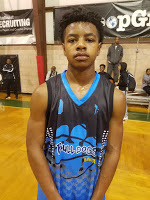 Jaquan Harris Guard (NJ Bulldogs) – Harris is a smooth point guard with elite size and athleticism. He can score, facilitate and defend multiple positions and in our eyes is making a case for the top guard in the class of 2022. Jaquan has the IT factor having the ability to take over games in a multitude of ways. He is one of the few players that we have seen that really doesn’t have any glaring weaknesses. He had 21 points including 5 threes in the semifinal loss to Team Thrill and 16 points including 3 threes against New World. 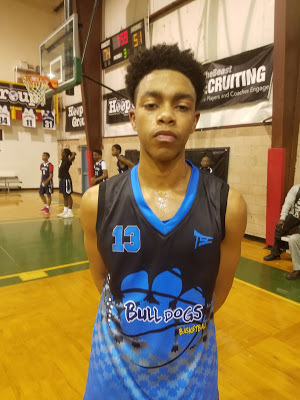 Corey Floyd, Jr. Guard (NJ Bulldogs) – Floyd is an athletic combo guard that is at his best attacking the rim from the wing or in transition. He is a nice complement to Harris as they can switch screens on the defensive end and when he gets going offensively Harris understands how to continuously feed him. He has range out to the 3pt line. He tallied 14 points in a semifinal loss to Team Thrill. 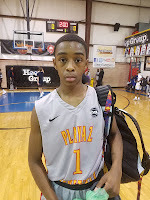 William Richardson Guard (NJ Playaz) – Richardson has to be considered one of the top floor generals in the Northeast. We saw him take over the game in a tough win against Team Loaded using an array high finishes off the glass and a nice finish with one hand to beat defenders at the rim allowing his shot not to get blocked. He navigates the pick and roll nicely with the ability to knock down the long to mid-range jumper if the defender goes under the screen. William also uses his ball fakes to get defenders off balance. He had 26 point including 3 threes in a big win against Team Loaded and dropped 12 points on four 3 pointers in a loss against New Heights. 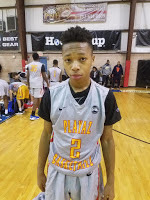 Dasean Lecque Guard (NJ Playaz) – Lecque is Richardson’s partner in crime that has a quick first step. He is a combo guard that can score in a variety of ways from all three levels. If needed, he can move over and run the point but at this point feels more comfortable playing off the ball as a scorer. He scored 10 and 9 points in the games we watched but he has the skill set to drop huge numbers in any game he plays. Rodney Rice Guard (Team Loaded) – Rice continues to impress us in every game we watch him play. 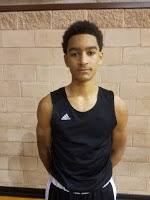 He is a scoring point guard that continues to get better running his team as the primary ball handler. His long range jumper is his strength but he also has a knack at getting in the paint and finishing with floaters and short runners over taller defenders. We saw him make some nifty passes including some nice lead passes down the court for some easy assists to his streaking teammates. He dropped 20 points in the loss to the Playaz. 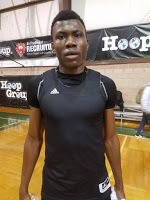 David Onanina Forward (Team Loaded) – David is a strong athletic forward that is refreshing to watch. He plays so hard leaving it all on the floor trying to do anything and everything to help his team win. He rebounds everything in the paint and blocks a bunch of shots. He finishes strong around the basket and can knock down his free throws. He finished with 13 points in the game we watched. 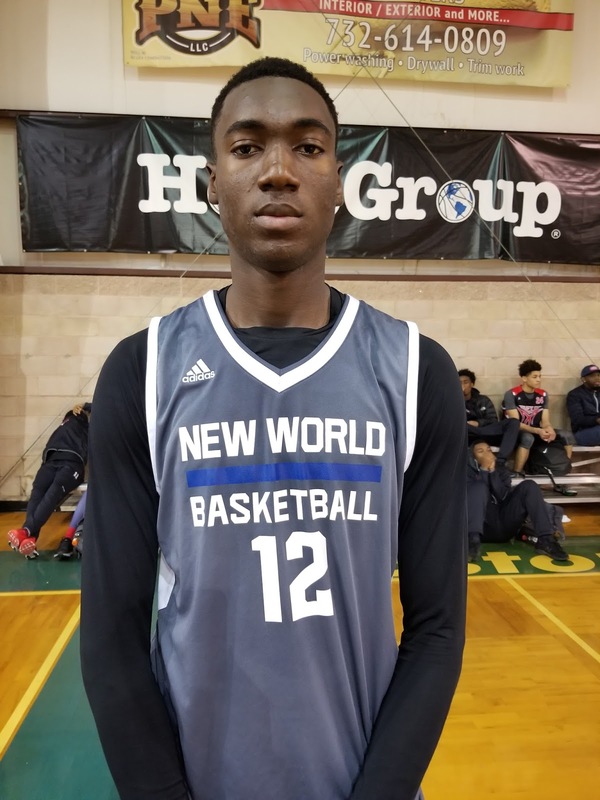 Favour Aire Forward (New World) – Favour is a 6’10 prospect with tons of upside and is oozing with potential. He can run the floor with ease and is just scratching the surface offensively. Right now he is more effective on the defensive end rebounding the ball and either blocking or altering the opponent’s shots in the paint. 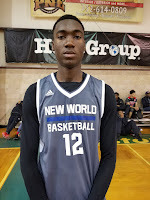 New World does a good job with skill development so we expect Aire to continue to progress at a rapid pace and look forward to tracking his progress.